To follow on from my previous post Botanical Brew and Mineral Water in Ipswich, I was contacted a while ago by a reader who has come across some bottles found in Bramford Lane, Ipswich marked 'Talbot and Co. Mineral Water, Ipswich' and asked me to try to find out about this company. As mentioned in my previous post, mineral water originated from the health spas around Europe, people thought that the waters had special properties and went to these spas to take the waters and improve their health. Mineral water suppliers at The Great Exhibition of 1851 introduced their product in bottles and by the end of the nineteenth century, mineral water was accessible to almost anyone. In the latter half of the 17th century, a spring was discovered on St George's Street, at that time is was very popular for the wealthy to flock to spas to drink and bathe in the fresh spring waters as an aid to good health. However, Ipswich already had a spa - the 'Ipswich Spa Waters' in St Margaret's Green and the idea of opening another spa in this area was rejected. However, years later the Talbot family may have spotted an opportunity just around the corner which was to be the making of them. In 1851, the Talbot family were living in Crown Street. John Talbot, born in Norwich, Norfolk, aged 50 was a Dyer, he was living there with his wife and six children the eldest of whom was his son aged 21 who was also named John and was also working as a Dyer. Father and son must have seen that there was an opportunity for in 1855 the first advertisement appeared in White's Directory. They were actually advertising their services in three sections; 1,Booksellers, Binders, Printers and Stationers; 2.Dyers and Scourers and 3.Ginger Beer and Soda Water Makers. It appears that John junior was selling books and stationery whilst John senior was running the drinks manufacturing together with the Dyers and Scourers business. By the time of the census in 1861, John senior, his wife Mary and their youngest son William had moved just around the corner from Crown Street into 12 St George's Street. John still stated that he was working as a Silk Dyer and his son William was a Soda Water Maker. John junior had been up to Norwich and had married Harriet Elvey Barr from Ireland. He had come back to live in Crown Street with his new wife and his two sisters Pauline and Levina. He described his occupation in the census as a Book Seller and Soda Water Maker employing 6 men and 2 boys. The drinks business was successful and the family ceased trading in Bookselling and Dyeing, just concentrating on drinks manufacturing. By 1881 and presumably after the death of John senior (I can find no further details of him after the 1861 census) John and Harriet were living comfortably and were able to hire a servant and John had doubled his workforce. By 1885 the business had expanded and another outlet had opened in Saxmundham. John moved from the hustle and bustle of the town centre to the very beautiful Plantation House in Burlington Road (which surprisingly enough I have visited. It is now owned by one of my personal heroes of history Dr John Blatchly, author and previous Headmaster of Ipswich School). Moving here was a step up the social ladder for John Talbot and a clear indication of a successful businessman. All the census returns after 1891 show that John was living on his own means which means that he was doing rather well indeed and was probably no longer directly running the business but had employed someone else to do it for him. By 1922 Talbot's had opened up another branch in Colchester, there were now four branches serving two counties and perhaps beyond. Although the advertisements for Talbot & Co maintain that the company was established in 1840, this is very unlikely. John Talbot senior does not appear in White's Directory of 1844, also he states that his occupation in 1841 was a Dyer as it was in 1851. John junior was only 12 in 1841 so would not have been doing any business. So it appears that there may have been a little exaggeration when making the logo/trademark of the company. Well into their eighties, Harriette passed away on 1 April 1925 and John followed just a few weeks later on 19 May. The couple never had any children and their estate worth over £25,000 (approximately £750,000 in today's money) went to probate. I have not found out what happened to their Estate. By 1933 Talbot Mineral Water were advertising as Talbot & Co Ltd, mineral water and cordial manufacturers; suppliers of A J Caley & Sons Ltd. Mineral waters; manufactory and office Unicorn Works, Foundation Street (TN 3212) and at Colchester and Saxmundham. They had moved their head office and works to Foundation Street which was also the site of a brewery and Inn and had ceased trading in Felixstowe and Stowmarket. A few years later they had expanded their services to include the wholesale selling of biscuits and tobacco. 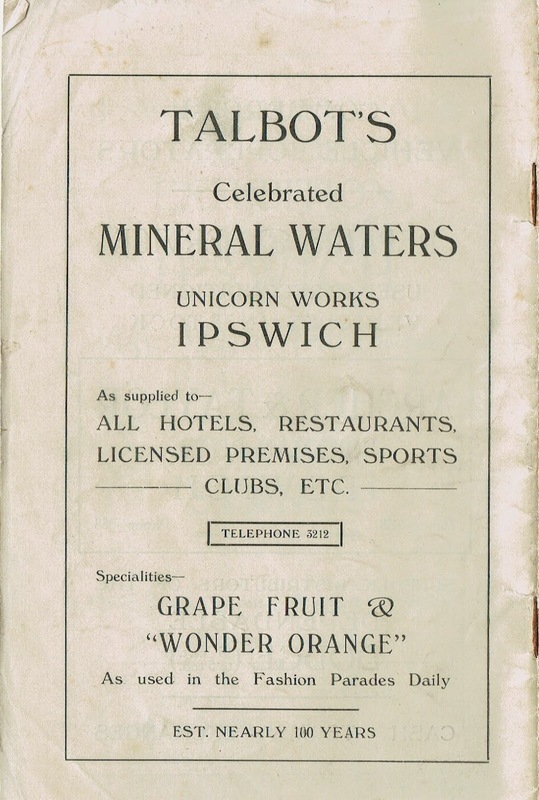 Talbot advertised their product on the back page of the souvenir programme for the Third Ipswich Ideal Homes and Trades Exhibition in February 1938 claiming that their mineral waters were celebrated and that they were suppliers to hotels, restaurants, licensed premises, sports clubs and that their specialities were used daily in the fashion parades! Although Mr Catchpole claims that his father founded Talbot and Co., (which is not the case) it is quite possible that he took over the business and moved the company to the premises in Foundation Street. I found Talbot & Co. in two further directories;1947 and 1956 and that is the last I found of the company. In Kelly's Ipswich Directory for 1958 Cantrell and Cochrane Ltd are the occupiers of Unicorn Works. I would be very pleased to find out any further information for this old Ipswich company which traded in Ipswich for over 100 years, I would love to hear from you. My deepest thanks to you for the fine research hours you have put in to get this article published. This article gives a clear insight into the history of the Talbot & Co Ltd, mineral water and cordial manufacturer and the family behind it. Thank you very much for your feedback. It's very much appreciated. just dug up clear Talbots Ipswich bottle along with a kirbys bottle, thanks for all the history you have researched. I also found an intact bottle which I dug up I Crowfield a few years ago. The research was a fascinating read. Cantrell & Cochrane were a part of the soft drinks business and were associated with Allied Lyons (as was)through Britvic. The implication being that C&C acquired Talbot to enhance its soft drinks side. Found a very early talbot bottle in Canada,thinking 1870's,cool looking, vertical writing and calling the drink gingerade. I picked up a small torpedo shaped bottle for £1 at a car boot sale this morning with Talbot & Co embossed on the glass. I just love the shape. Many thanks for your research. Very interesting to read about an old local company. I can add to your account: John Talbot was uncle to my grandfather, Charles Talbot Hunt (1871-1922) of the mineral water manufacturers Hunt and Sons, of Great Yarmouth and Norwich. The 'Talbot' in Charles's name was not accidental. John Talbot and James Hunt, Charles Talbot Hunt's father, each married sisters of the Barr family. Charles Talbot Hunt as a young man lived in John Talbot's home for a period, his own mother having died when he was six in the 1918 flu epidemic. Sadly, Charles Talbot Hunt died at the age of 51, predeceasing his uncle, John Talbot. My father and his younger sister (b.1916) and brother (b.1918) were very young orphans at their father’s death in 1922. John Talbot had already made Charles Talbot Hunt a major beneficiary of his will: he probably regarded him as the son he had never had. After C T Hunt’s death, John Talbot (who himself died in 1925) made two codicils to his will, leaving money to the trustees made responsible for the upbringing of my father and his siblings. Because of this, ‘Talbot’ is my second name. By coincidence, although I and my brother researched our Hunt family history some years ago (and my father and brother visited Ipswich to see where John Talbot had lived in Burlington Road), we had never seen John Talbot’s will. I have just yesterday (27/09/18) got this from the wills web site, so was delighted to find your lovely web page about John Talbot. Thank you very much for providing all this wonderful information about the Talbot family, your ancestors. It's always nice when someone shares their knowledge and it also makes the research worthwhile. Hi, Are you sure that the first ad in the White Directories is of 1855? It is rather strange that a Trademark is shown. 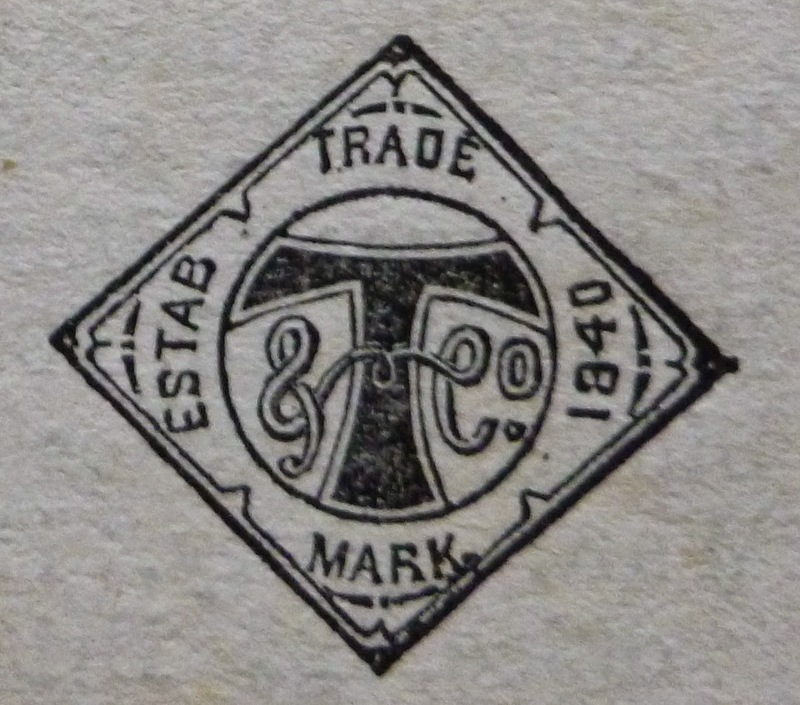 Trademark registration started only 1876. How can you explain this. At the time I am working on small studies in relation with matchbox labels. In the early 1950's Talbot imported a lot of matches from Belgium. The last order was in May 1955.